A few years ago, Eddie painted wooden peg dolls for a couple of the girls. In a move or two, they were lost or left behind. There had been requests for new dolls to be acquired and painted. Eddie, being the fabulous dad that he is, set to work on making his girls (and boys) simple toys that encourage the imagination. 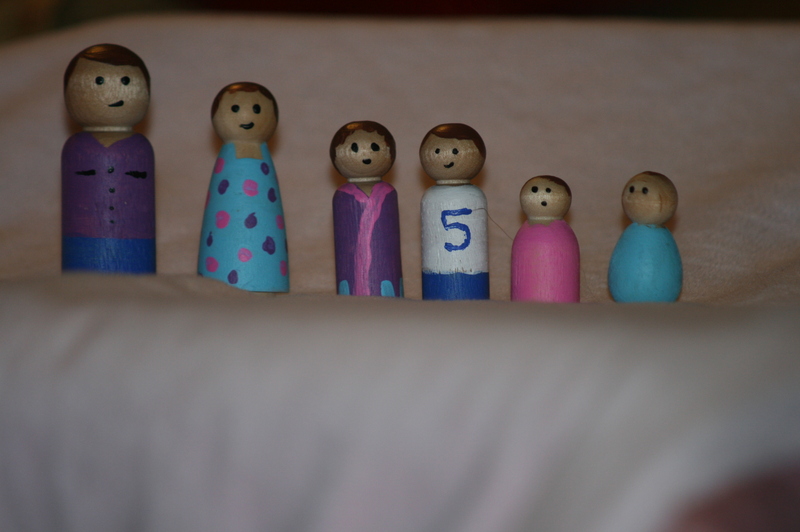 A few bottles of paint, a brush, and a good cup of coffee was all that was needed to create these cute families. Dad, Mom, and 4 children. Plans are to expand the family every now and then. Adorable, yes? I love the little baby! 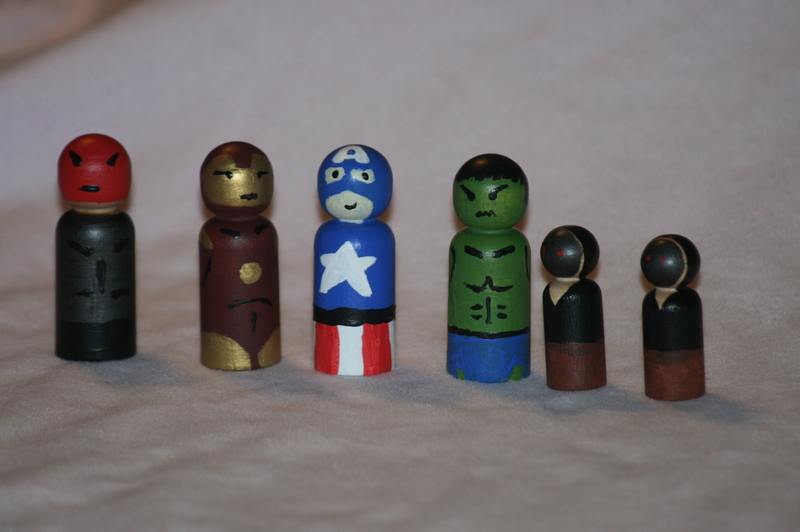 As Eddie was painting these, more ideas of how to design them kept popping up. I can’t wait to see future ones! 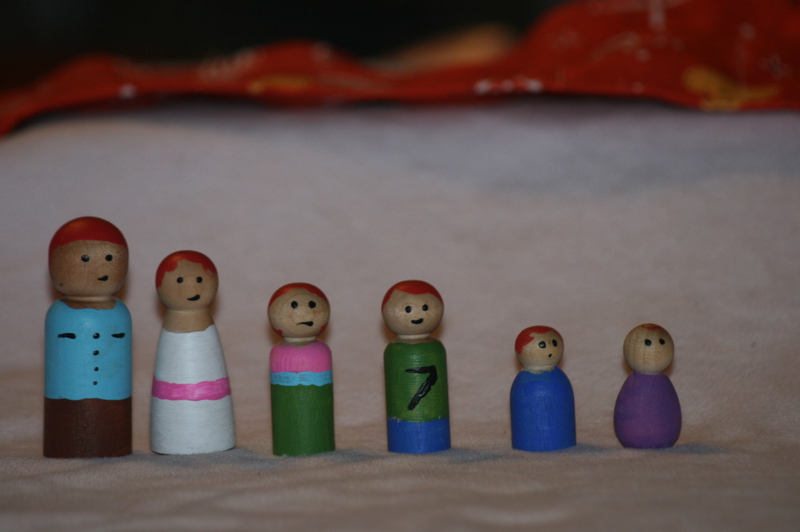 And Lydia, of course, had to have a family with red hair! These are great toys for travel. Small and easy to carry. Can play with them anywhere! These went to Caleb so that he can play with Sam for some brother time. How Eddie freehands all of this, I do not know! 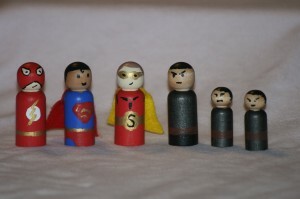 Then, of course, for Sam we have Superman and Super Sam! 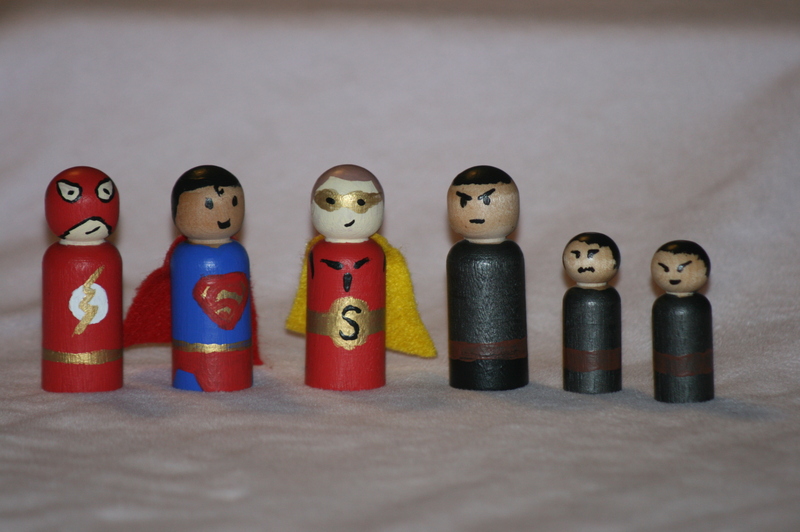 A little felt and a little glue for the capes. There are lots of plan for the future…farm animals….city workers….so many possibilities! 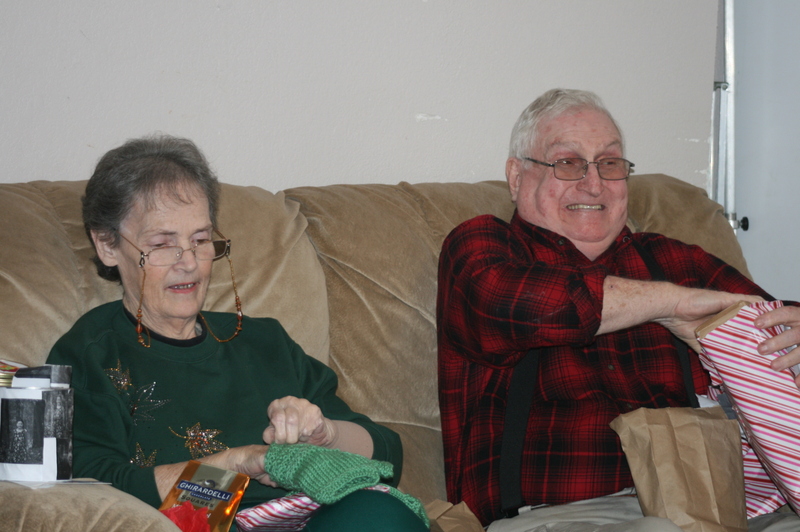 This year, I just wasn’t sure what to gift the grandparents. I wanted something that would be special and specific to him or her. I didn’t want to gift something just for the sake of gifting. Granddad (my father-in-law) had me stumped this year. Then I was diligently researching a range of topics on Pinterest, ahem, and found some wall art with the above quote on it. 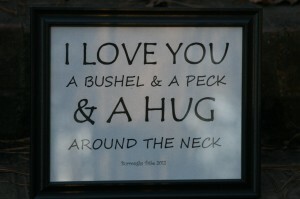 Now my oldest child is almost 14 and for almost 14 years, I have heard my father-in-law sing “I love you a bushel and a peck and a hug around the neck” to everyone of my children. I can hear him in my mind right now. Treasured memory! 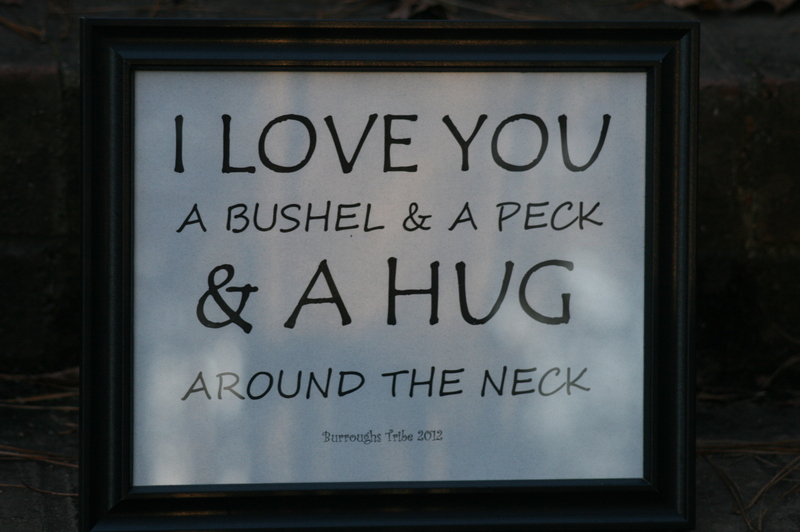 I used the resources I had available and whipped up the above framed sign for him. I hope it makes him smile each time he sees it. Love this verse…so does Grammy! After creating the print for Granddad, I wanted to do something similar for Grammy ( my mother-in-law). 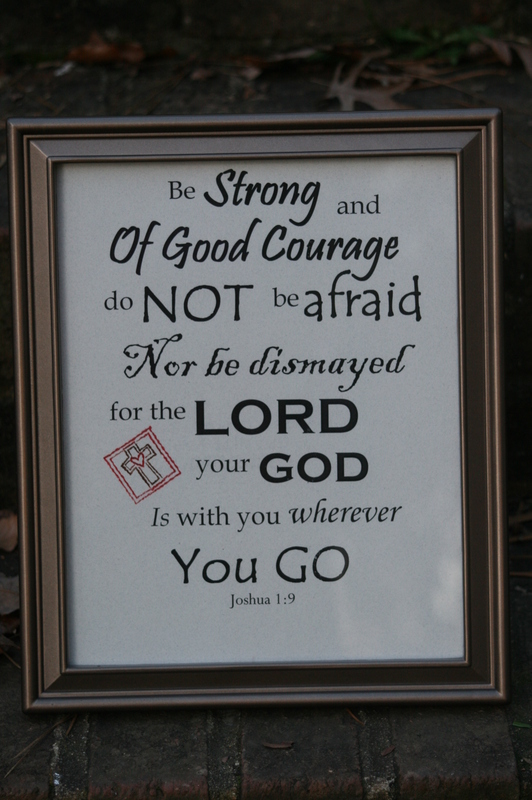 I had several ideas but decided to use her favorite Scripture verse; one of my favorites as well. I realized too late that my spacing was a bit off but hopefully she doesn’t mind. 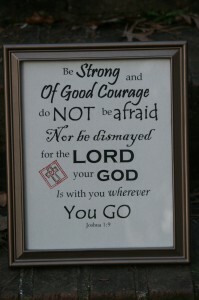 I pray that when she sees this verse hanging on her wall, that she will be blessed with the reminder that the Lord is always with her. What a comfort! Granddad and Grammy also were given handmade items from the children. Mary knit fingerless mitts for Grammy, Bekah gave Granddad a “One a Day” Scripture Medicine jar, Caleb made pencil holders, Lydia made a love “Remembrance Jar” with a cross stitch cover and Hannah made bookmarks. Knitted gnomes and handmade cards were in the stash as well. With a little time, thought and creativity, very special gifts can be given to bless those you love! For full disclosure, I have absolutely no personal knowledge of this show, Dr. Who. The plot, characters, setting elude me and the desire to learn more is not in me. However, I participate in a Secret Sister Christmas exchange with a dear set of friends. When I was given the name of my sweet sister friend, I knew exactly what she needed this year. Dr. Who Scarf knitted by me! 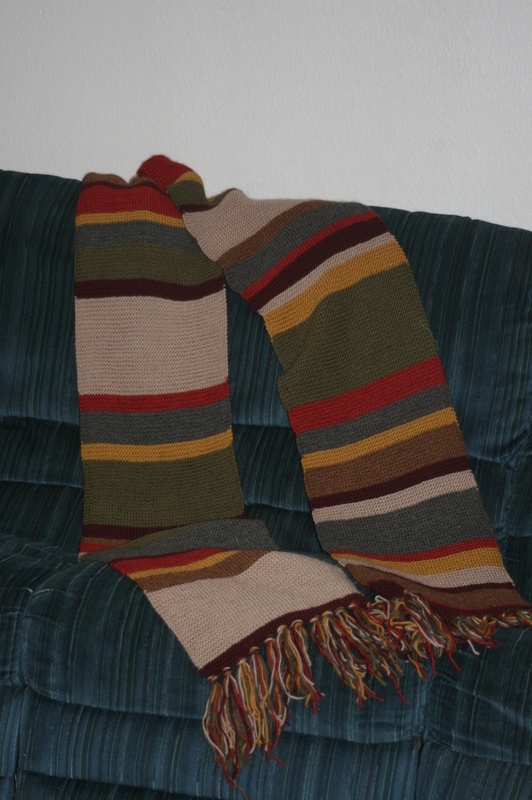 I consulted with a fellow Dr. Who friend for some guidance on a trustworthy pattern and I utilized the pattern, yarn colors and tips from Dr.WhoScarf.com to keep me on track with this scarf. When I completed the Dr. Who Scarf it was over 6 feet long and will continue to stretch as it is worn. Yes, my friend is actually using the Dr. Who Scarf. How fun! 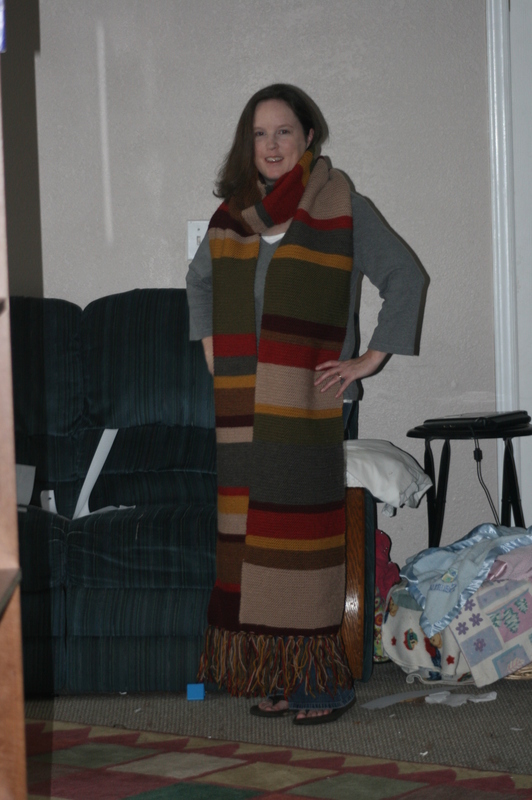 Modeling the scarf before sending it on its way…. After spending weeks knitting this scarf, I was so worried that my friend would hate it. I was thrilled when she absolutely loved it and is wearing it! No fun just letting it hang in a closet. Love the colors in this scarf! 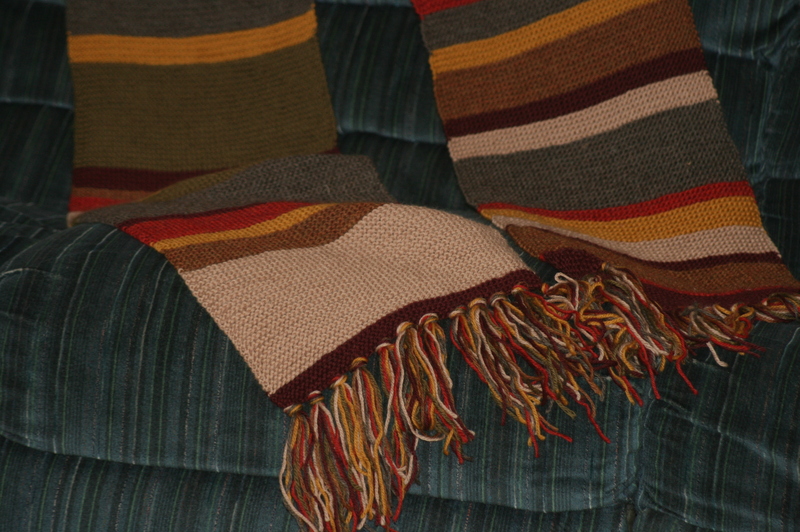 While time consuming just due to the length, it was a simple knit. There were a few moments of panic. I ran out of yarn at one point and was concerned that my order would get lost in the Christmas package rush. Thankfully it arrived just in time! Family members repeatedly offered to take it but I protected it. 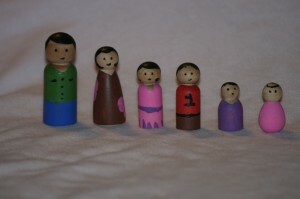 The following weeks brought on more Christmas gift crafting that I am looking forward to sharing with you. I was able to snap pictures of most things before sending them off!